Cephalopelvic disproportion (CPD) occurs when the size of a mother's pelvis in misaligned with the size of the infant's head during childbirth. "Cephalo" refers to head and "pelvic" refers, of course, to the pelvis. "Disproportion" means they do not fit together. The real risk is not an infant that is too small for the pelvis, but rather an infant that is too big. During the delivery, the baby has to navigate his or her head to get through successfully. Instead of dropping through, he or she has to screw his or her way through the pelvis. If the baby gets stuck, there is a real risk of oxygen deprivation, which can lead to catastrophic injury and death. Failure to recognize or appreciate the clinical presentation of probable cephalopelvic disproportion is medical malpractice if harm is caused to the child. Sometimes doctors just do not see the problem when they should have, or they use medicine or medical devices that make the problem worse. 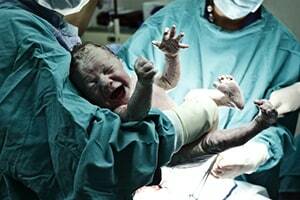 Often, the better plan is to do an emergency c-section which can be done in a matter of minutes. If you believe that your child was harmed by medical malpractice, call us at 800-553-8082 or get a free online case review. CPD is usually diagnosed before labor begins. But doctors should know of the risk of a large baby. Usually, an ultrasound is used to estimate fetal size, along with a pelvic measurement to estimate proportion. The delivering doctor needs to make sure that there are no signs of cephalopelvic disproportion. If there is a concern about cephalopelvic disproportion, it is an absolute contraindication not to give Pitocin. A doctor can only rule out cephalopelvic disproportion by examining the patient beyond just a vaginal examination. If you cannot rule out CPD, the mother should not be given Pitocin. Doctors who do not refrain from the injudicious use of Pitocin can cause uterine hyperstimulation and iatrogenic fetal distress that may make CPD or shoulder dystocia an insurmountable challenge. It is amazing how many medical malpractice lawsuits involve CPD. Below are sample settlements and verdicts in lawsuits alleging negligence in taking the appropriate precaution necessary to navigate known or potential cephalopelvic disproportion. These are a tool in helping better understand the potential value of these claims. But these cases cannot predict the value of your claim. There are simply too many factors in each case to try to predict the value of an individual claim. 2017, Colorado Verdict for $4 Million: Malpractice claim is based on doctors decision to use vacuum extraction to complete vaginal delivery after 10 hours of labor, despite recognition of cephalopelvic disproportion. Plaintiff’s claims that presentation of CPD after prolonged labor should have warranted an emergency c-section. the baby suffered permanent brain injuries as a result of the doctor’s negligent use of vacuum extractor for over 20 minutes. The case went to trial in El Paso County, Colorado and the jury award Plaintiffs damages of $4 million. 2014, Michigan Settlement for $5.5 Million: Infant child suffered hypoxic ischemic encephalopathy during delivery resulting in brain damage, cerebral palsy and a seizure disorder, requiring lifelong care. His lawsuit contended that the doctors failed to respond timely to fetal heart rate patterns that were indicative of distress, timely respond to excessively frequent contractions and maternal pushing efforts, timely discontinue the administration of Pitocin and diagnose cephalopelvic disproportion. Had the doctors done so, they would have realized that a cesarean section was the appropriate path for this delivery. 2012, Pennsylvania Verdict for $55 Million: Plaintiffs contended that the OB/GYN failed to recognize fetal hypoxia, discontinue Pitocin, and deliver by C-section before the child was irreparably injured. All of the signs pointed to a CPD problem: big baby, small mother, and an overdue delivery. While thankfully the child was left mentally intact, there was a real possibility the child would be confined to a wheelchair for the rest of his life. 2013, New York Settlement for $4 Million: Infant who suffered permanent injuries including seizure disorder, ischemic encephalopathy, brain damage, motor and developmental delays brought a medical malpractice lawsuit alleging a negligent delivery. Specifically, the contentions were failure to take a proper medical history and failing to realize the baby's size could cause a CPD issue because such limited testing was done on the child. If you have suffered from medical malpractice from a misdiagnosis, we can help you learn about your options and determine whether there is a path for you to get compensation for the harm that has been done. Call us today at 800-553-8082 to discuss strategies to get you compensation for your loss. There is NO COST OR FEE of any kind for this case evaluation. You can also get a free online case review.